In fact, design is only one of the 5 main ingredients of UX: psychology, usability, design, copywriting, analysis. We at AltexSoft have adopted a similar approach, which is fully customized based on the specifics of your project. 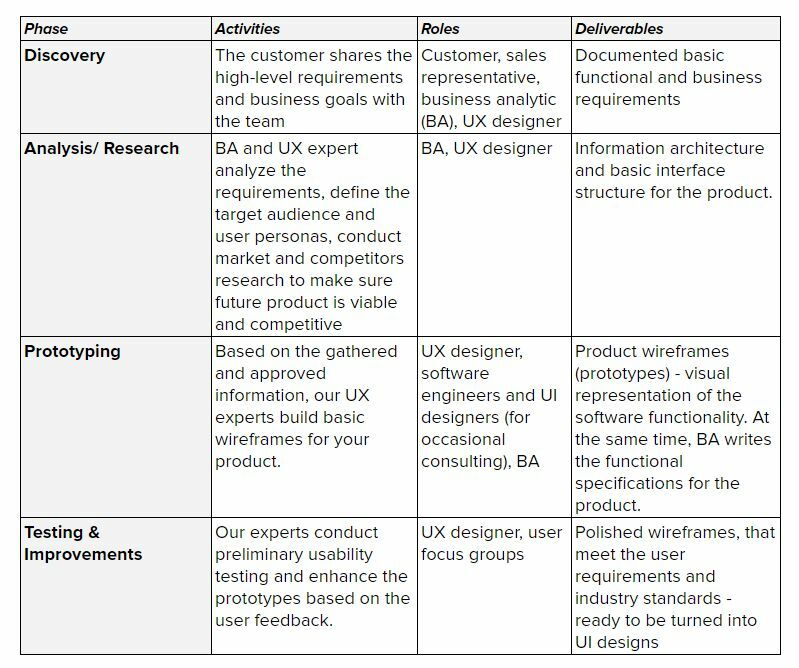 A typical UX development process contains the following stages. According to the Nielsen Norman Group, up to 80% of usability issues are usually detected by only 5 test users. At the prototyping stage, there is no need for large focus groups and significant investments into the process. However, this early testing proves extremely valuable in the long run. Being able to detect and fix the possible issues early, saves time and efforts. Making a simple change in a wireframe takes about an hour. The same change in the UI design might take up to one day. And it might take even more time and efforts to implement this change after launch. According to the Customer Experience Optimization Report by eConsultancy.com, 94% of respondents have seen higher conversion rates as a result of their commitment to customer experience. The famous case of a “$300 Million Button” is a great example of how simple UX improvements can make a huge difference in business. By simply removing the obstacles in the checkout process (making the registration optional), the company was able to grow conversion by 45%. This resulted in additional $15 million revenue within a month and total $300 million of annual revenue. In his bestselling book “Software Engineering: A Practitioner’s Approach“, Robert Pressman describes a situation when a proper UX process can help you save money in the long run. He states, that if an issue costs $1 to be solved at the design stage, it would cost $10 to be solved during the development and $100 – after the product’s release. A research shows that at least 50% of the development time and effort are spent on changes and fixes that are avoidable. For a team of four charging $50 per hour, that makes $4000 in waste every week and over $200,000 annually. The numbers don’t lie: The study finds that 23% of users uninstall an app after only one use. Furthermore, an impressive 62% will use it less than 11 times. While UX might not be the only problem that pushes your users away, it is one of the things you can and should fix. This is especially true for enterprise products and corporate applications. Simple and easy to use tools require less training, minimize the risk of error, and improve the efficiency of your business operations. Improving the operational efficiency of a team of 10 by 10% could bring up to 40 additional hours and $1,000 in savings per week (with an average hourly rate of $25 per employee). In case of McAfee Inc., the company was able to cut the support effort (and the corresponding cost) by 90%, simply by providing a clear and user-oriented design. Supposing that a support call costs $10 to process, reducing the number of such calls from 100 to 10 means up to $900 in savings. While the user expectations and needs are constantly growing, setting the bar high for new products, having a good UX strategy is an important aspect of the business. User-centric companies, such as Apple, Coca-Cola, IBM, Intuit, Nike, Starbucks, Target, and Walt Disney, are setting the pace in almost every industry. That said, proper UX design has a major impact on the business ROI and plays a significant role in the software product development process in general, contributing to the creation of a more consistent, relevant and overall higher quality software product.